FREE PERKS WHILE ON DUTY??? 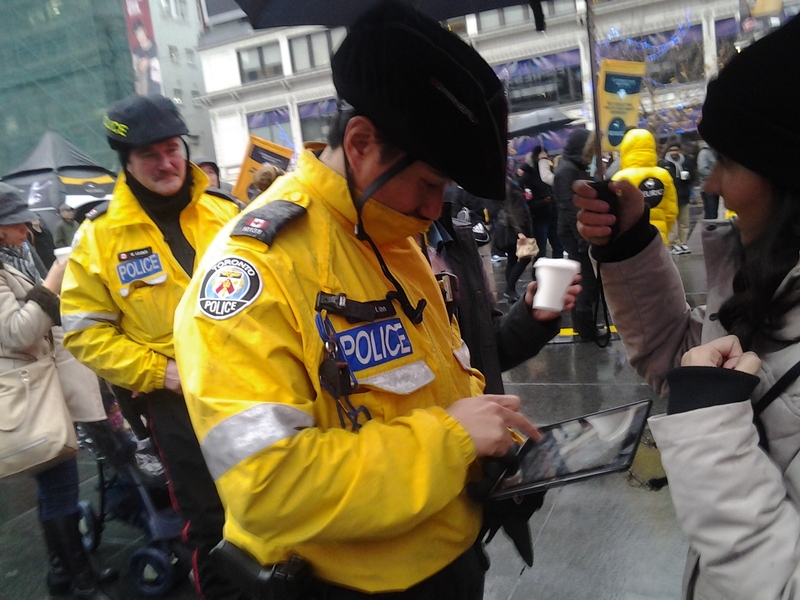 | TORONTO'S FIRST "Cop Watch"
FREE PERKS WHILE ON DUTY??? 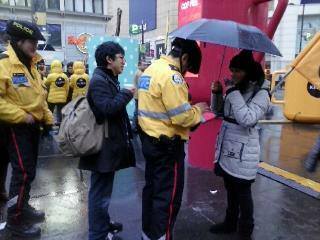 I am flabbergasted at what a group of concerned Torontonians witness last 2013-11-22 at Dundas Square, two (2) of your well paid officers while on duty were serving themselves to free perks.. Excuse me? but you keep saying we need more cops because CRIME is Low.. Here is a link to the “proposed” budget for the year 2014… Oh boy.. want more money… Really eh? I have a lot to say on the future discussion of the T.P.S Budget and I will show this clip to the Board.. I demand that you correct your officers… they should be facing Disciplinary action and furthermore their SARGENT/SUPERVISOR should be also reprimanded for allowing this outrageous waste of taxpayers money… for the record this event occur during the INTERNATIONAL DAY OF HOUSING ACTION.. Rally at Dundas Square… as usual COPS from either 51 and/or 52 division “uninvited” join us for some observing and wasting tax payers money.. We are peaceful protesters with no intentions of engaging in violence.. look at this video… they outnumbered us and since there is nothing else for them to do I witness a couple of cops lining up for a free coffee sample that a local shop set up at Dundas Square.. now wait a minute I don’t condemn their getting a coffee hey it is my break time.. it was during WORKING HOURS.. for freaks sake!!!.. and worse wouldn’t a cop earning $95K a year afford a cup of Java from “Starbucks” ?? 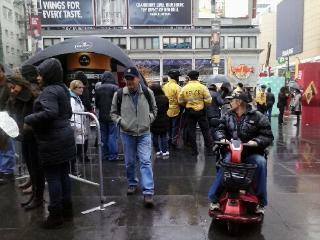 In addition there are other (2) officers in the line up behind the two (2) closer to the Coffee Booth.. So in total there were four (4) officers wagging the dog in my opinion. We meed a reply Chief Blair… enough is Enough!! !